Home safely and by waiting until almost the end of the event I got to play with the X100 a little bit and take some pictures with it. Will do a full report in the morning. The HS20 is a big zoom camera that looks to be very exciting, for those who don’t want a system like a DSLR but do want the big zoom that would cost a fortune on a DSLR. According to Fuji they want everyone to experience the X100. Some good points about optical viewfinder benefits and the hybrid viewfinder. This is the camera that I am most excited about. Hopefully we can beat the crowds and get our hands on it. Love the picture of a classical rollieflex twin lens camera to illustrate depth of field. Lots of talk about new Film Simulation mode so you can make your images look like Fuji Velvia for example. Very cool. You can also choose the camera sound for quiet Leica like or to DSLR mirror… Why? 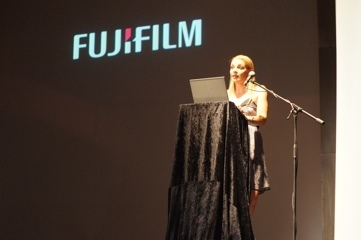 It’s 8pm and we are being briefed on the 2011 lineup of Fujifilm digital cameras here. Lots of talk about their real photo technology and the new 3D cameras. The slogan, “shoot 3D, view 3D and share 3D” which is where the limitations have been on 3D. Will update with more information as we come to the end.